This is a postal cover, posted using Easy Post label (private/alternative mail provide) in Spain. It was put into Easy Post postbox at La Sirena, Platya D'en Bossa, Ibiza town (Balearic Islands) on 25 October 2012 to an address in Penang, Malysia. The shop keeper has been advising that country other than United Kingdom will require two labels, despite the warning, I only put one label. The label was International Post Service, bought at a shop in St Miquel on 22 October 2012 for €0.80 a piece, whereby in some other places one label only cost €0.75 - the price difference could either be because of the price is not regulated or the seller just inflated the price (the former is likely). 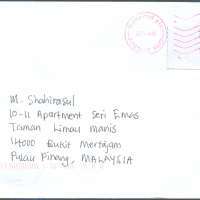 The letter was delivered 41 days later later by Pos Malaysia on 4 December 2012 and the postmark dated 22 November 2012. 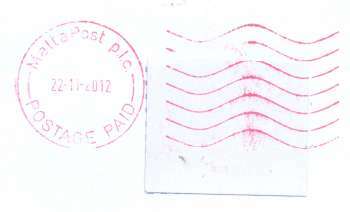 The postmark was by Malta Post Plc. The Easy Post label has been covered (but not removed) with a white blank sticker. The printed orange magnetic strips is presumed to be printed by Pos Malaysia.